Motorcycle Oil for your Motorcycle? Ok, so it’s different but what makes AMSOIL better? Motorcycle engines and automotive engines function differently, and the lubricants that service them have different requirements. Six crucial differences between motorcycle and automotive engines are outlined below to illustrate why oil engineered for motorcycles is the best choice for your bike. Now for the Extreme test!! Hold on to your hat for this one, I was so impressed by this I thought I would grab the text from this AMSOIL brochure. So glad AMSOIL added this whole testing wing to the AMSOIL Center with bays capable of doing multiple tests at once. Watch the video which demonstrates the test laid out within the paragraphs. Harley-Davidsons* and other bikes with big V-twin engines generate significant heat, especially in low-speed parades, in rally traffic or on long climbs on hot days. Motor oil plays a critical role in cooling these big air-cooled engines, and even more so in low-speed operation with limited wind generated to cool the bike. If the oil can’t withstand the heat, its ability to protect your bike is compromised. To demonstrate its extreme-heat protection qualities, AMSOIL 20W-50 Synthetic Motorcycle Oil was subjected to a dynamometer test designed to simulate conditions even more extreme than the demanding stop-and-go driving conditions of a motorcycle rally or parade route. A 2012 Harley-Davidson FXDB Dyna Street Bob* motorcycle equipped with AMSOIL 20W-50 Synthetic Motorcycle Oil was subjected to a strenuous low-speed test cycle, with significant idle time broken by short bursts of engine revving and little to no air moving across the cylinders. Like most Harley-Davidson motorcycles, the Dyna Street Bob features an air-cooled V-twin engine, which relies on cooling fins arrayed along the cylinder walls to conduct heat away. To create the most-severe operating conditions possible, the electronic temperature controls, which safeguard the motorcycle when temperatures reach dangerous levels, were deactivated. The combination of low airflow and inoperative temperature controls allowed the test lab to subject the oil and engine components to intense heat not normally experienced in the real world. Cylinder temperatures reached more than 500°F, and oil temperatures exceeded 300°F – temperatures well into the range where oils begin to break down and often lead to catastrophic failure. 500°F is No Problem The extreme temperatures were no match for AMSOIL Synthetic Motorcycle Oil. After nearly 70 minutes of torturous testing and heat exposure, oil analysis revealed no change in oil viscosity and only minor levels of oxidation, TBN depletion and wear (see graphs). 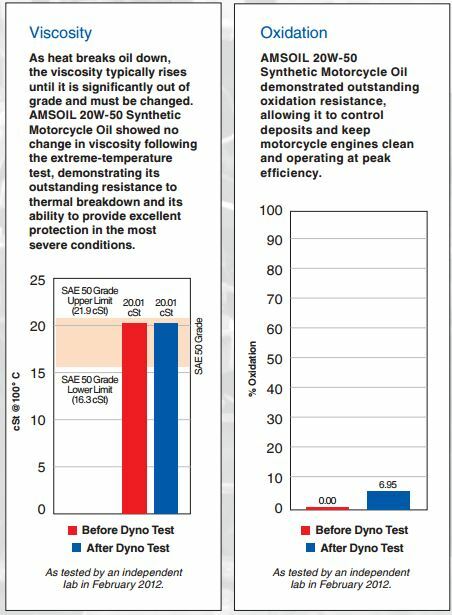 Not only did AMSOIL Synthetic Motorcycle Oil prevent the engine from overheating and seizing during the extreme dyno test, it did so without losing chemical integrity or ability to protect vulnerable engine components. 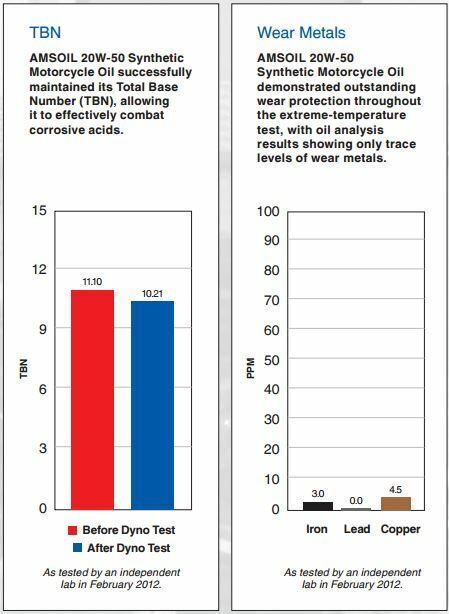 This stands as further proof that AMSOIL Synthetic Motorcycle Oil provides outstanding protection in even the most compromising and severe high-temperature riding and idling conditions, providing peace of mind that your air-cooled V-twin is protected even in low speeds on hot days. 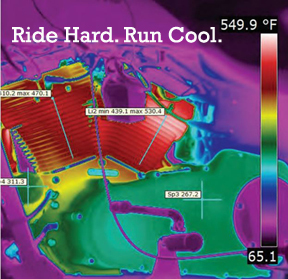 Your bike should never get this hot. If it does, AMSOIL has you covered. Want to help us get the word out? Join us as a dealer and earn money from commissions. Check out my dealer page. We offer a LOT of support and AMSOIL University training. See our page on AMSOIL Dealerships.